Note: This article was originally posted in 2014 and updated on 05/12/16. 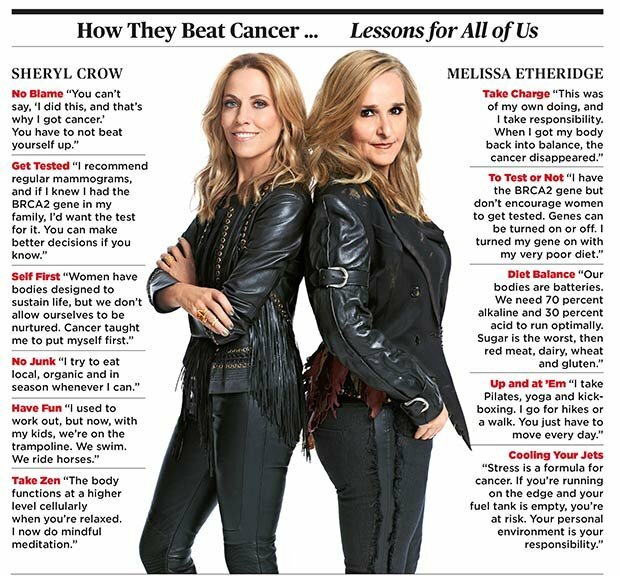 An AARP article that contained an interview with rock stars Sheryl Crow and Melissa Etheridge brought awareness to the individual and personal nature of genetic testing, hereditary breast and ovarian cancer (HBOC), and the medical challenges that accompany inherited breast cancer. The article also led to some heated responses from members of the HBOC community. The HBOC community has had its share of celebrities. Whenever public figures disclose that they carry a BRCA mutation or have hereditary cancer in the family, it raises the profile and awareness of hereditary cancer. Christina Applegate, Sharon Osbourne, and, most prominently, Angelina Jolie, have all revealed their mutation status. Others, like René Syler, Cynthia Nixon, and Wanda Sykes have shared their family histories, and although they have not tested positive for BRCA, some other familial factor may be causing breast cancer in their families. It’s difficult enough making medical decisions around HBOC, but celebrities have an added burden of being in the public eye. People look up to them. As individuals in the spotlight share their journeys and decisions, the public assumes they have access to top information and the best doctors. More weight is given to celebrities’ opinions and medical choices than those of the average person, and we often take for granted that celebrities’ statements are accurate. The AARP interview quoted Ms. Etheridge as saying, “I have the BRCA2 gene but I don’t encourage women to get tested.” Although she doesn’t use the word “regret” it certainly sounds as though she has misgivings about testing. Melissa Etheridge is a member of the HBOC community, and by extension a member of FORCE’s constituency. FORCE empowers people to make informed medical decisions. We validate their feelings, and support people on the HBOC journey. I support Ms. Etheridge’s decisions, but I am saddened to think she has regrets about her choices. Ms. Etheridge said in the AARP article that her doctor recommended testing, but she never mentions receiving genetic counseling from a qualified expert. I do think this could have changed her perception of genetic testing and highlights the value of receiving comprehensive information on which to base your medical decisions. Information can be the antidote to regret. In the interview, Ms. Etheridge also says, “Genes can be turned on and off. I turned my gene on with my very poor diet.” FORCE wrote a letter that was co-signed by members of our scientific advisory board and sent to the editor of AARP regarding Ms. Etheridge’s statement. USA Today subsequently published an article about our letter to AARP which included interviews with members of FORCE and the HBOC community who expressed views that differed with Ms. Etheridge. Many members of our community consider the information received from genetic counseling and testing as lifesaving. In FORCE’s letter, we expressed concern that readers may think that BRCA mutations and their effects on cancer risk can be modulated solely with diet to prevent cancer, and conversely that those with mutations who become diagnosed with cancer somehow caused it with a poor diet. Although several studies have shown that eating a healthy diet can lower the risk for certain cancers, these studies have been large-scale general population studies, and the actual protection for a given individual may be small. There are many reasons to eat a varied and healthy diet, including protection from numerous diseases. But not enough evidence suggests that diet and lifestyle alone can protect people from BRCA-associated cancers. I do want to point out that our letter was directed to the editors at AARP and not Ms. Etheridge, who is entitled to her opinion on testing. Our issue is the lack of context and evidence-based information that surrounded her statements about cancer risk, diet, and genetic testing that could have educated AARP’s readership, and helped readers to make their own informed decisions about whether or not to undergo genetic testing. Access to credible information and support via FORCE empowers people to make the medical decisions that are right for them. Ms. Etheridge’s example highlights the critical need for FORCE to continue our efforts to help people feel empowered and live the healthiest and most fulfilled lives possible. To this end, FORCE just recently launched our Peer Navigation Program, which offers one-to-one personalized support for by matching people to trained volunteer peer navigators who have faced similar decisions and challenges. When HBOC is in the news, it opens a discussion, demystifies inherited cancer, and removes the stigma associated with words like cancer, mutation, and mastectomy. Medically inaccurate information about cancer, genetics, and HBOC, however, is abundant in the media and harmful to consumers. This is why FORCE developed our XRAYS (eXamining the Relevance of Articles for Young Survivors) Program, which is supported by a grant from the Centers for Disease Control. The funding comes from passage of the EARLY Act, legislation that was first introduced to Congress by Representative Wasserman Schultz, who also carries a BRCA mutation. The EARLY Act funds programs by organizations that focus on young women and breast cancer. FORCE’s XRAYS Program allows us to critically review articles in the media, correct any inaccuracies, and write a lay level summaries of the research or information presented. The reviews are accompanied by an “at-a-glance” graphic representation for readers to easily determine if they should read and believe the article and what relevance it may hold for their situation. Regardless of her personal feelings about testing, I hope that in time, Ms. Etheridge is able to recognize that many people (not all) feel that having genetic information about cancer risk can improve their health outcomes, and that she appreciates the value of a more balanced public position on BRCA testing. Thank you for your enormous work. Now I believe I can test for the breast and ovarian cancer genes without groundless fears. Here in Wilmington, DE. The testing of the brac 1/and possibly 2 was suggested to me by an excellent breast surgeon in the 90s. I was fearful. But I see clearly that information is vital. I have regrets about allowing a doctor to use fear tactics to bamboozle me out of my uterus and cervix. FORCE has known that BRCA mutation carriers do not carry an increased risk of uterine or cervical cancer yet they sit on the fence so as not to challenge women healthcare providers. There has been a ‘hint’ of a risk that is squishy at best. Besides uterine and cervical cancer is detectable and generally not life threatening. HOWEVER, doctors take this opportunity to remove as much as the law will allow with no accountability to what they destroy. The ‘talk with a genetic counselor’ DOES NOT go into the detail of what the trade off is and many women take enormous hits on their quality of life. I for one, would take it all back in a heartbeat and risk ovarian cancer. Which, oh my the way, my ovarian cancer risk have proven to be NOT as high as I was told…..As long as women ACCEPT this barbaric offering, early detection for ovarian cancer will not be a healthcare priority. After all, why would it be, if it would provide the vast majority of brca woman a reassurance that the cancer would be caught early. Then they would probably say NO to these barbaric surgeries..